Greetings from the road! My name is Katie and I live full-time in my Sprinter van while working remotely. I started living in my 144” WB Mercedes Sprinter High Roof van full-time with my partner in June of 2017. I’ve always been eager to travel and wanted to focus a bit on my home-country, so this was the perfect opportunity to do so. I really liked the idea of being able to bounce around and have the freedom to wake up every day and decide what I felt like doing, instead of planning every detail of a trip out. Once we became more serious about making our dreams a reality, we purchased the van. I continued to work full-time until I had saved enough money to live off for a while, then we quit our jobs! About 6 months into living on the road, I knew I was going to need a bit more funds so I started applying to remote gigs. 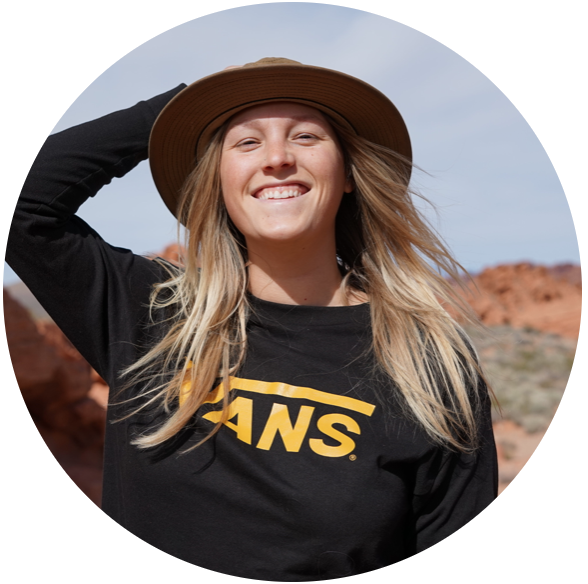 Now I work two amazing remote jobs that I love: one as the Editor-in-Chief for Go-Van, an online magazine and resource for all things revolving around vanlife cultures, and as a Social Media Specialist for Travel Her Way! I am so passionate about the companies I work for and their mission of inspiring others to travel and give back to their communities. Converting a van into a home on wheels was my way to achieve my travel goals, live life at a slower pace, and begin a life of minimalism. The van conversion took about 6 months and we were able to do most of the work ourselves, with the exception of the cabinets. We were lucky enough to have family help along the process as well, which helped everything move at a quicker pace. A big requirement for the build was having the proper tools, space to work on the van, and having patience for all the small details in designing our home. The conversion happened in phases: installing the windows and the fan, wiring the electrical system, insulating the entire body of the van, putting up the walls/ceiling boards, etc. The build of our van looks similar to any tiny home you might see. We have a two-burner propane stove, a stainless steel sink, even running water. Our electrical system includes two solar panels on the roof, so all our energy is renewable. Our fresh water tank is in the back of the van and requires filling usually once a week. Our “dirty” water from our sink and doing dishes drains to a grey water tank that we simply dump when it is full. We even have a tiny toilet that squeezes into the corner of the van. Since everything is smaller in a van, our chores need to be taken care of more frequently than they would in a house or apartment, but we don’t mind. Dumping our water, toilet, emptying our trash, even deep-cleaning our entire home, can all be done in easily under an hour. Once the conversion was completed, we purged a large majority of our belongings and moved into the van. We kicked of our trip with a bang and drove all the way up to Alaska, exploring the state for a total of a month. Since then, we have slowly been making our way across the United States, exploring different National Parks, State Parks, and searching for the best (free) campsites our country has to offer. Most days, we try to drive a maximum of 3 hours, sometimes not at all. We usually shoot for the goal of settling down for the night by about 5:00 PM. We try to travel during the day but keep our nights to ourselves. We enjoy “happy hour” with a glass of wine or a beer, cooking dinner at a leisurely pace, and finishing off our nights with some television or a movie, just like we would if we lived in a house somewhere. We have more time for hobbies and exploring new interests! Something I really wanted to learn about during this time on the road is cooking. I’ve always eaten quick and easy meals, since I never had the time to learn more about cooking. While my skills started out very minimal, I’m proud to say that I now cook 3 meals a day from scratch! It’s taught me so much about what I’m ingesting and how foods affect me. I’m also able to often buy local foods at farmers markets in the areas I’m visiting! I never would have had the time to sit and focus on learning this new skill if it’s wasn’t for the free time I have while living out of the van. Currently, we have explored and camped in every single state in America. Some of our favorite states have been Colorado, Michigan, Montana, Florida, and New Mexico. All the above mentioned states have beautiful scenery and really promote outdoor exploration and activities. Most of my free time in these particular states was spent fishing, hiking, swimming, and camping. These states also have an abundance of free camping, which I love. Since money is limited and we are traveling full-time, we definitely live on a budget and campsites can be super expensive. We spend a lot of time exploring BLM and National Forests for the most beautiful (and free) places to stay. Another one of my favorite places we’ve visited is Wyoming. This gorgeous state is the home of Grand Teton National Park and Yellowstone National Park. Prior to moving into the van, we purchased an “America the Beautiful” pass, which grants us access to all National Parks in America. (We also have a Discovery Pass for Canadian Parks). Both National Parks are located in close proximity to the remarkable area of Jackson Hole. Some of the most beautiful campsites we’ve ever experienced were in this area. Traveling is completely possible – you just have to make it a priority. We recognize that the idea of quitting your job and deciding to travel can be scary. How will you make money? What happens if your mode of transportation breaks down? There are a million things that we could worry about and the crazy thing is, we don’t know where we will be in another year. That’s kind of the point though. We could have waited to do a trip like this until we are retired but we have no idea what kind of physical shape we’ll be in then. We wanted to do this long-term trip now, when we have nothing tying us down and we are young. I might not have a lot of personal belongings but I get to travel in the comfort and convenience of my home. Between the two of us and a way to explore new places every day, we’re more than satisfied. Katie is a digital nomad based out of Portland, Oregon. She is currently following her philosophy of doing life a little differently by living full-time in her self-converted Sprinter van. Her 62-foot residence can be spotted around North America, always in a new location and on the hunt for the best craft brewery.